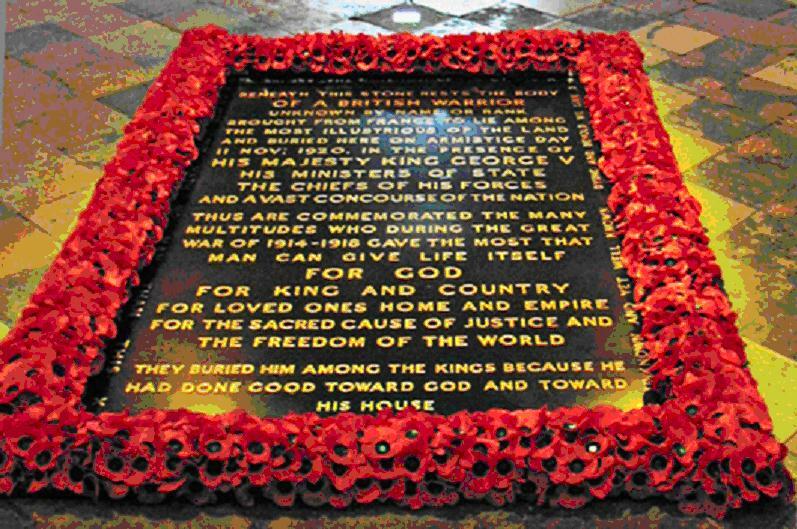 The Tomb of the Unknown Soldier can be found at Westminster Abbey in London. The famous tomb contains the remains of an unidentified British soldier killed during the First World War. A reminder of the ultimate sacrifice made by so many. Throughout history men and woman have died fighting in wars with their remains never identified. The idea for the Tomb of the Unknown Soldier war first conceived by David Railton, an Army Chaplain who served on the Western Front during World War I. After the war was over Railton mentioned the idea to the Dean of Westminster, who thought it was a splendid idea and shortly afterwards, he got the backing of the Prime Minister, the King and Military Chiefs who ensured it become a reality. A lot of effort and diligence went into ensuring the soldier chosen to be laid to rest in Westminster Abbey was in fact British and totally unknown. One body was exhumed from each of the battlefields at Aisne, Arras, Cambrai, Somme, the Marne and Ypres. The bodies were then placed in an army hut at St Pol, Brigadier-General Wyatt then entered the hut blindfolded and touched one of the coffins, which would become the Unknown Soldier. On the 11th of November 1920, which was the second anniversary of the armistice, the unknown warrior was laid to rest. On the same day in Paris La tombe du soldat inconnu was placed in the Arc de Triomphe.